Agency Marketing Machine of Miami FL celebrates a milestone in their groundbreaking ‘Agents of Change’ movement launched just 3 years ago. To date, participating insurance agencies have raised over $500,000 and contributed almost 2400 volunteer hours to local charities across the country. Agency Marketing Machine (AMM) of Miami, FL celebrates a milestone in their groundbreaking ‘Agents of Change’ movement, which has been creating buzz in the insurance industry. Since its inception just 3 years ago, the 241 agencies participating in the movement have now raised a whopping $505,934 and contributed almost 2400 volunteer hours to local charities. The multi-disciplinary team at AMM creates completely new charity initiatives every 2 to 3 months for each agency, with accompanying public relations campaigns including robust social media, email and text messaging outreach. Additionally, a vibrant community magazine developed by AMM for each client shines a spotlight on the initiative each month. Customers, friends and compassionate community members are invited to donate to the campaigns, but AMM has also implemented a unique twist which allows community members to get involved and donate to local worthy causes without affecting their own pocketbooks, by simply referring family and friends to the agency. Insurance agencies across the country wishing to make a difference in their communities and their businesses are partnering with AMM to craft innovative long-term marketing programs around this powerful movement. The groundswell of support building from coast to coast includes noted insurance agency owners, one of them, Cheryl Bowker in Michigan. 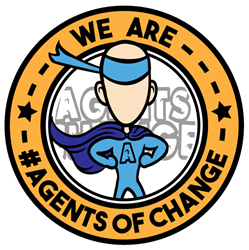 Early adepts and strong carriers of the Agents of Change hashtag (#agentsofchange), Bowker and her team have consistently rallied for the community, and are currently supporting the efforts of local volunteers who distribute backpacks filled with food to children considered “food insecure” in the area. Another vital cornerstone of the Agents of Change movement is the volunteer program. Each insurance agency’s staff is regularly prompted to volunteer as a team, both for their current Community Causes and for other charities in need of a helping hand in their area. That the program has been embraced is an understatement – it’s clearly thriving. In the short time since its inception, over 1300 families and nonprofits have found support from local insurance agencies. A good thing, indeed. Agency Marketing Machine is out to change the world with their Agents of Change movement, making a difference one insurance agency, and one community, at a time. To learn more about the movement, please visit http://agentsofchangemovement.org/. Agency Marketing Machine is a full-service marketing firm headquartered in Miami, FL. Their multi-disciplinary team focuses on growing exposure by creating community engagement and positive recommendations for insurance agencies nationwide. They partner with companies looking to make a positive impact in their communities, and their agencies, on a consistent basis. To speak with one of AMM’s dedicated team members, please call 786-322-5011. To learn more about the company, visit http://agencymarketingmachine.com/.